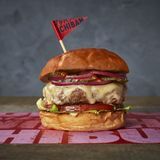 Ichibuns is an eclectic restaurant offering a fast-food menu of gourmet burgers, flavoursome ramen and hand rolled maki rolls. Do you work at Ichibuns? What did you think of Ichibuns?